From My Front Porch To Yours: Top Post of All Time! Top Post of All Time! Hey y'all! Hope your weekend is going well! We are suppose to have some severe storms later on today but hopefully they won't be as bad as predicted. Praying for all those in the path none the less! I didn't include this pic in the original post so I thought that I would add it now. Here is what our laundry room looked like before we moved in. I had the builder move the cabinets over because I didn't like them right in your face when you walked in the room and because I thought that they looked better centered over the washer and dryer. Now on to the original post which posted back in November of 2010! Welcome, so glad you decided to stop by! I am joining in on several linky parties this week because I am soo excited to share with y'all my laundry room. Why my laundry room you may be wondering!? Because it is the keeper of a fabulous piece I just finished giving new life to! If ya wanna see how our laundry room looked like before you can go here. It is quite a transformation on a very little budget and with really very little effort involved. This is my fave doorstop ever! I purchased it at HobLob in the clearance isle sometime last year. I think I paid all of $3 for it. These are my drying racks. The builder did not install any sort any hanging rod so I had to come up with my own. I saw this on another blog and a light bulb went off. I had to have them which again come from HobLob. The top of the cabinets are still being fluffed but I think I have a good start on it. My lil bird house came from Cracker Barrel back in the summer. It was suppose to have ended up outside but the tree it was going on was chopped down by the power company. Loving my lil' tray. I still need to make a label for the detergent though. Here is what ya saw when you first walked in the laundry room that is after I kicked the cats to the curb. Well not really the curb! I would never do that to my furry babies. They relocated upstairs to a rarely ever used bathroom. I think all parties involved are much happier now. I was SOOOO tired of seeing the automatic pooper scooper every time I walked in here that I HATED walking in here. This area I am still working on as well. I actually will be raising the shelf up some and placing two wrought iron hooks below it to hang extra hangers. And what is that at the bottom you may be wondering? Why it is this beauty that I purchased last week from the local yard sale site. I hunted for almost two months for a dresser that was the perfect size. It needed ALOT of work and even had some water damage but nothing a lil' ol paint couldn't hide! ;) See those wooden knobs? I spent almost thirty minutes trying to get the one off. Needless to say I gave up and they all met the fate of a hammer which went much much quicker! Here is what she looks like today!! I am soo thrilled to have this piece done! I actually set a record by having her done and back in the house within three days of buying her! Usually I hem and haw and debate on what I want to do with a piece but I knew exactly what I wanted to do with her which made the process go very smoothly. At first I attempted mixing up some paint samples I already had to achieve a yellow. Well it came out more like butter and so the next day I went to SW and purchased a sample size of Midday. I used the dry brush technique and just brushed it on lightly to give it a subtle two tone effect. After that I used an antiquing glaze that I purchased at HobLob for less than $2 with a coupon. Even though the top shows sooo much wear and tear I decided to just sand it down and re stain it with some walnut stain. I wanted to keep some of its old charm. I went to yes HobLob yet again in search of some knobs yesterday. I was originally thinking glass vintage looking knobs but some lady form out of town was literally grabbing up almost every knob she could put her hands on because one they were half off and two she did not have a HobLob. Part of me was soooo irritated at her cause every one I wanted she grabbed but then the other side of me completely understood and would have being the same thing! It all ended well because I am just loving the knobs I did come home with! In case somebody may be wondering, yes our laundry looks just the same over two years later. I admit I am wanting a change but I have not decided just how to accomplish that yet. Some things I want to do are to paint the cabinets, repaint the dresser, take down the fluorescent lighting and replace with a chandy, and paint the room overall. Will it happen any time soon? Probably not because well it really does not need it. It is just fine the way it is but every now and then I crave change in here. I can see why this room makeover was among your highest viewings Pamela it's FABULOUS!! Love Love that dresser!! Did you also paint your white cabinets? No wonder this was one of your most viewed. I also love love the dresser. You did a fantastic job on it. Great accessories too. 3 day, I'm impressed. 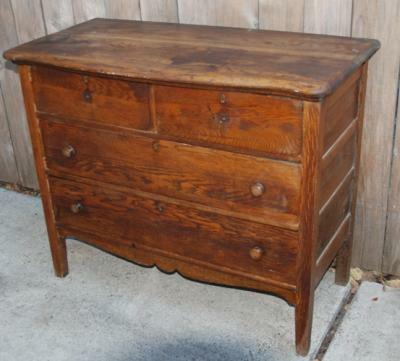 Your dresser is gorgeous, love it! You Laundry turned out beautiful I love the little black shelf. Thanks for sharing. This is definitely one of my favorites! I love the dresser in there. I can see why! That room is such an extension of the rest of your beautiful home. So lovely and warm. The chest is so cute and I love (lots) that black wall shelf. Doing laundry in there must be at least somewhat fun ;) It sure is pretty!! This is a fabulous post...your laundry room looks so clean and well decorated. I definitely would not put off doing laundry the way I do here! lol! Love the yellow dresser and the knobs you chose...beautiful, great job! I still love that yellow chest! We are just gearing up to do a little work in our laundry room and this post gives so much inspiration-it's beautiful! I particularly love your chest. What a great post it is no surprise that it was your top post. I love, love that yellow chest. It is beautiful.